As the Pratt Digital Preservation & Archives Fellow at NYPL, I’ve been working with the Library’s Digital Archivist to address issues surrounding software preservation. This presentation will discuss such digital preservation tools as Wikidata, PRONOM, and Archivematica—and how they’ve been implemented toward the long-term preservation of a proprietary software and its associated file formats. 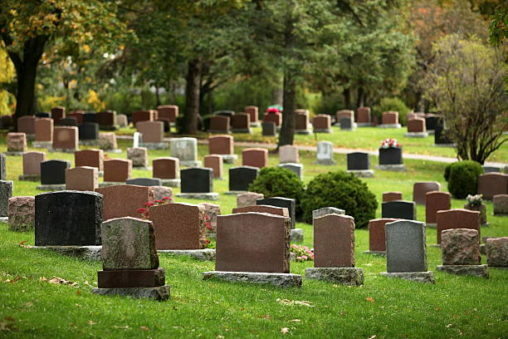 In 2017, National Archives and Records Administration (NARA) approved Immigration Customs Enforcement (ICE)’s request to destroy records of in-custody deaths, assaults, and misconduct in timelines that range from 3-20 years. This project explores the history of ICE’s recordkeeping practices and examine NARA’s justification for this appraisal. This is a presentation on the uses of 3D Scanning to digitize and share objects from special collections and for cultural heritage. It will describe methods of 3D scanning and different ways to use the scans to digitize objects, connect with the public, share the objects with other institutions. 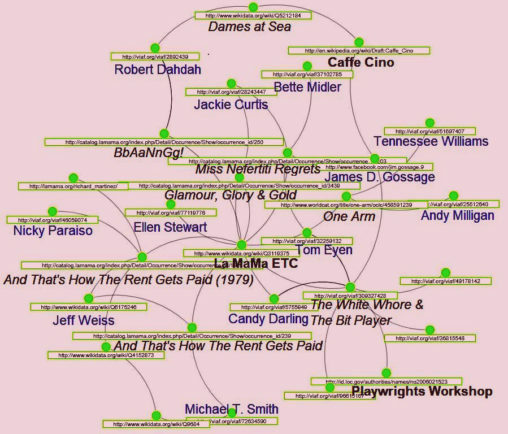 In this presentation, students from the course LIS 668 Projects in Moving Image and Sound Archives present their work in digitizing, curating and making available to the public the public-access television program DykeTV. 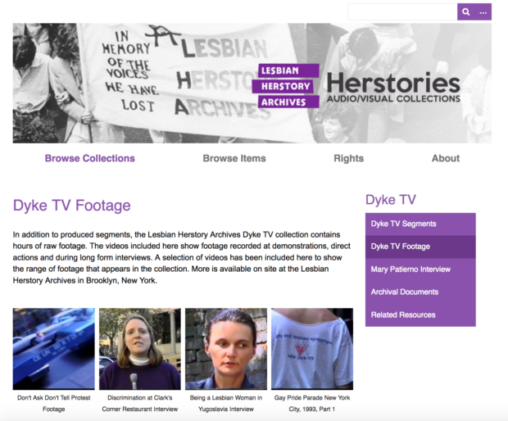 The collection is housed at the Lesbian Herstory Archives and was reformatted from aging analog U-Matic video. Projects in Digital Archives students present on a collaborative project with the Brooklyn Public Library to digitize audio interviews from the Civil Rights in Brooklyn Project. 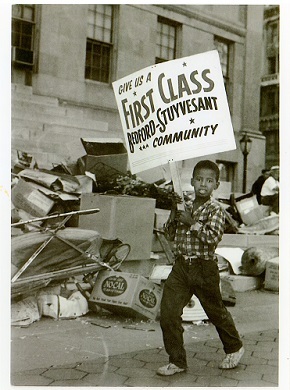 The interviews include interviews with notable civil rights activists from the Brooklyn chapter of the Congress of Racial Equality (CORE). 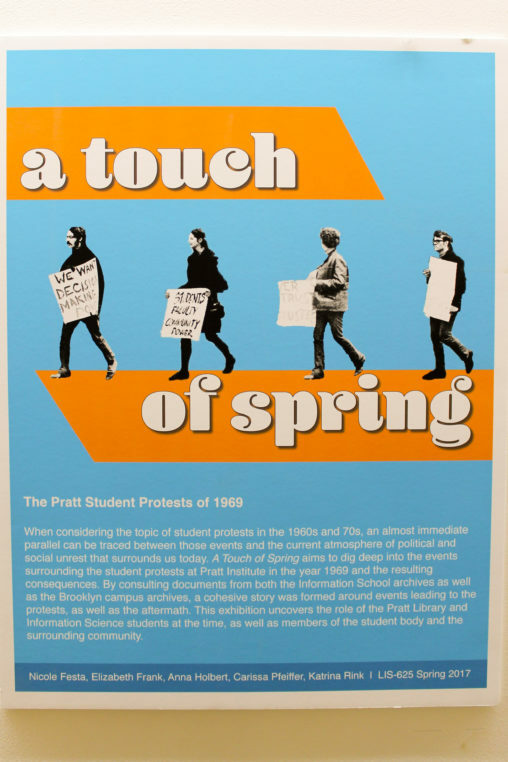 In the spring of 1969, Pratt Institute erupted in protest. Students, faculty, workers, and members of the community joined together and forced the school to shut down to address issues of civil rights, neighborhood gentrification, and other social and political concerns. This presentation discusses an exhibition currently on display on the 6th floor that makes use of archival records documenting this turbulent period. 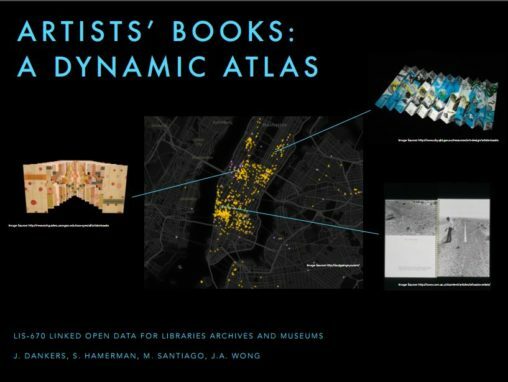 The project is a mock IMLS Grant Proposal for “Artists’ Books: A Dynamic Atlas.” This pilot project will use linked open data to create a dynamic mapping interface that indicates the home libraries of artists’ books located within New York. Led by the MoMA Library in partnership with the Frick Collection, Brooklyn Museum, Whitney Museum, and Metropolitan Museum, the dynamic atlas will deepen engagement with these unique collections; allow users to visualize connections between artists, books, and institutions; and make project data available for use on the open web. Our project, Artists’ Books Holdings, is an attempt to analyze and visualize data about artists’ books holdings on an international scale. This project is a work in progress created in LIS 644- Programming for cultural heritage. It illustrates our ability to work with data in a programmatic manner and create visualizations that represent data in a more human readable manner. Students from Projects in Digital Archives will present their work on archiving and digitizing select portions of a photography collection spanning architecture and design from the 1970s. The photography was created by architectural photographer Bill Maris and donated to Pratt a few years ago, and features photography in several formats. Abbey Bender will present the online digital archive for the Daughters of Bilitis (DOB) Oral History Project created by students in LIS 668. The DOB was the first women’s LGBT social and political organization in the United States. This poster highlights our research as student members of the Linked Jazz project, an ongoing exploration in applying Linked Open Data (LOD) technologies to cultural heritage materials. Research directions include the use of LOD for dataset enrichment in digital humanities research; creating RDF triples to describe image resource types; and mapping elements from various music and jazz databases to assign entities and properties from ontologies. The Brooklyn Connections PSA is a short video designed to encourage teachers to participate in the Brooklyn Connections program at Brooklyn Public Library with their classes. By exploring the programs mission and goals, and showing some of the fantastic projects completed with primary sources with the BC staff, this small group created a PSA that will be used by BC to promote their program on their website. Research project and exhibition catalog utilizing collections at the Metropolitan Museum of Art. 12 objects selected (including 2 rare books!) from different departments, miniatures as precious objects researched and explained, a catalog designed in InDesign, end product: digital book. Cited 175 annotated references, included descriptions for 17 items. The first English-language Robinsonade to achieve sales of any note, the Hermit (attributed to Peter Longueville, 1727), is explored in detail in this descriptive bibliographical report. A keystone of LIS practice in rare books, descriptive bibliography is, as Terry Belanger notes, “indispensable” (1977). The report will be presented in poster format, with high-resolution color illustrations. Mobile digital information resources based in special collections! A WordPress-based pathfinder to the history of the American Revolution in New York City (1776-1783), exploring locations in Brooklyn, Manhattan, Staten Island, Queens, etc., and utilizing resources from NYPL special and digital collections. I also created a Google map of important sites. Panel discussion exploring the current methodologies regarding the documentation, description, and management of artist records and their works of art in three distinct professional environments– working with a living artist, working in a foundation, and working in a museum setting. A survey of the practice of digitization of archival collections, how it is being accomplished, what the benefits of it are, and what concerns need to be kept in mind. This is a paper addressing current concerns in legal libraries and librarianship, particularly those arising from the rise of digital resources. My presentation itself focuses on the technology-driven push for innovation, particularly issues presented by legal blogs.